I just finished my second book by American writer Cormac McCarthy. From the way in which he is spoken about, McCarthy is one of those authors who appears to be an American treasure. He also represented that a little-explored region for me - the works of the Caucasian male writer. So, sometime last year I decided to remedy that. I walked into Waterstones in Notting Hill and conveniently for me, there before me were virtually all his books lined up on a shelf. I picked No Country for Old Men because it was smaller and less intimidating than all the others. Plus, of course, I had seen the film, which I figured would make it easier for me to follow the plot. Well, that was a good choice. It was a fast and suspenseful read. So I was excited to try another. 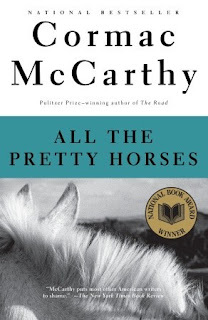 For my second book, I picked All the Pretty Horses, another one of his books, which was made into a film. In brief, the book chronicles the journey of sixteen-year-old John Cole Grady, who leaves the ranch he has lived in all his life after it is sold by his mother. In search of adventure, Grady and his friend Lacey Rawlins set-off on their horses southwards to Mexico. The book started off very slowly and I really wasn’t sure what was going on and who was who. So, I kept flipping back to re-read the previous paragraphs to see what I might have missed. After a while, I stopped doing that and decided that I would figure things out as I went along. Despite the very slow and confusing start, the plot gradually picks up. In their time away, Grady falls in love and embarks on an ill-fated affair. He and Rawlins are arrested and thrown into a Mexican prison, where the rule of the day is Kill or be Killed. Oh wait, am I giving away too much? 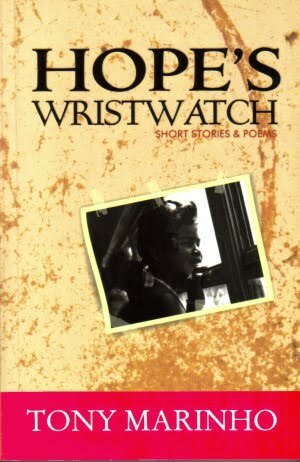 From being a book that I had to struggle to get into, it became a book that I couldn’t put down. For a while. There are many conversations, which take place in Spanish and are written as such. Initially, I attempted to translate every line, before moving on. As the Spanish conversations became more commonplace in the book, I gave this up. In any case, you get enough of an idea what’s happening and this is not too much of a problem unless you are one of those people who absolutely has to understand every line. When I read No Country, I deduced that McCarthy always writes in lean, spare lines, not using more words than he needs to. That assumption was completely overthrown with Pretty Horses. The prose here is beautifully descriptive and paints vivid pictures of, among other things, the landscape through which Grady and Rawlins are riding. The problem with that, for someone like me, is that my mind tended to wander off on its own journey (totally unrelated to the story) at times. My interest in the plot ultimately kept me reading, but for someone who is easily distracted, it’s not the easiest book choice. After the violence and the often heartbreaking sadness that occurs in the book, the ending – particularly Grady’s conversation with the judge – seemed a little too trite in its attempt to make sense of all the events of the book. I read that Pretty Horses is the most accessible of the three books that makes up the Border Trilogy. If it took such effort for me to read All the Pretty Horses, I wonder what my experience with the other two books will be. A new post!! Yes, yes, please don't fall over your chair in shock. This blog has just been on a sort of extended hiatus, NOT retirement! I'm dedicating this post to John, who asked me what's up with Ore's Notes and encouraged me to start writing again. Yes, my busy schedule notwithstanding. And although I have plans to change the look of my blog and have made a project of looking for the perfect template..... He urged me not to lose focus of what was important and to Just start writing again!!! He helpfully shared tips from his highly prolific wife who also blogs. One might take my silence to mean that I’ve not been up to much. Sigh……… nothing could be farther from the truth. So instead to talking about how much I’ve been doing and how I don’t have time to blog anymore, I won’t. I’ll share some of the things that I’ve been doing. Where do I start? How about the most exciting thing I’ve done in the last 6 months? What could that be, you might ask? I went scuba diving!!!!! And the strange thing is that until the moment I decided to take diving lessons, I can’t say that it’s something I’ve ever thought about doing. But you know what it’s like when an idea pops in your head out of nowhere and you just go with it? No? Okay, maybe it’s just me then. I was blessed to visit Mombasa, Kenya last September for a workshop (the places that work takes me sometimes……..). The resort we stayed in was like a dream. I could have moved in there if I had the chance. One of the most advertised things about the resort was the variety of water sports they offered. On my first day there, my colleague and I walked to their office to find out more. As I spoke to the very nice lady there, she suggested a ‘fun’ dive, which even 12 year olds could do. Well if a 12 year old can learn to dive, then so can I, was my first thought. The day after my workshop ended I went back to the water sports office to speak to the staff more about this diving thing. 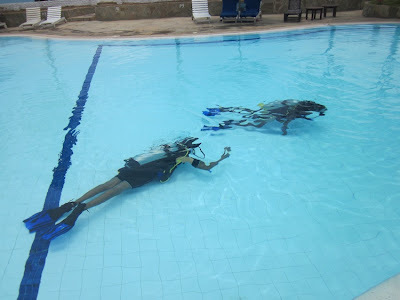 I met the instructor Emmanuel aka the dive master, who assured me that it was all very easy. He said I’d have to pass three tests first, before I could book a real dive in the ocean. Suddenly I grew nervous. I don’t relish tests. And this diving thing was starting to appear very complicated. For the lesson, I wore a wet suit, as Emmanuel said the body can get very cold when in water for long periods. He showed me how to use the mouthpiece to breathe and that was very strange at first and initially I was anxious and panicked a bit, but I decided to stay calm and try it. Breathing techniques from Pilates really helped me out there. I was able to take slow breaths in and out through my mouth. I learnt the hand signals, because divers have to be able to communicate underwater with the diving master or other divers. He also showed me how to get water out of my goggles even when underwater (sounds impossible, right?). Somehow I passed all the three tests he administered. So well apparently, that Emmanuel kept asking if I had dived before. So, now I could book a dive. I was so excited, but also a little nervous. Emmanuel gave me some instructions: get a good’s night sleep, eat a good breakfast (not too heavy but not too light). I was scheduled to dive to a depth of 10 metres, which I thought sounded so deep. The upside was that my diving instructor would be there. 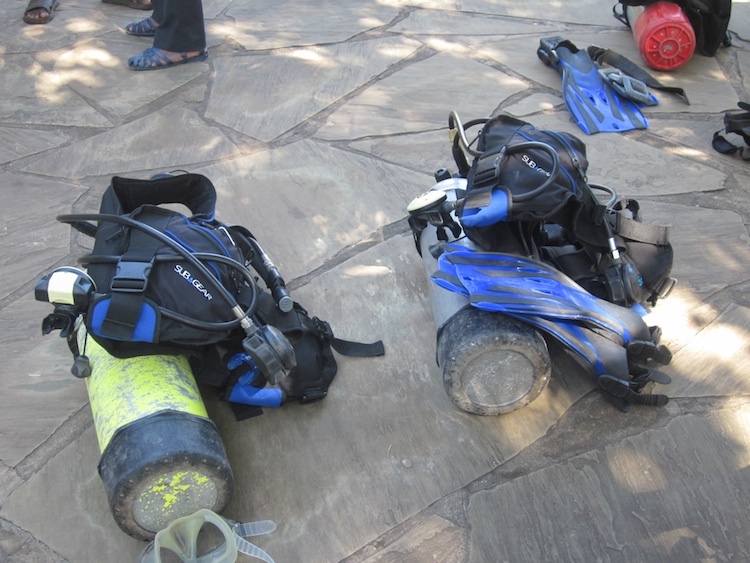 Most divers are encouraged to dive with a buddy or a group. I believe only professionals go alone, but I think even that might be rare. There are certifications that you can take to enable you dive deeper. 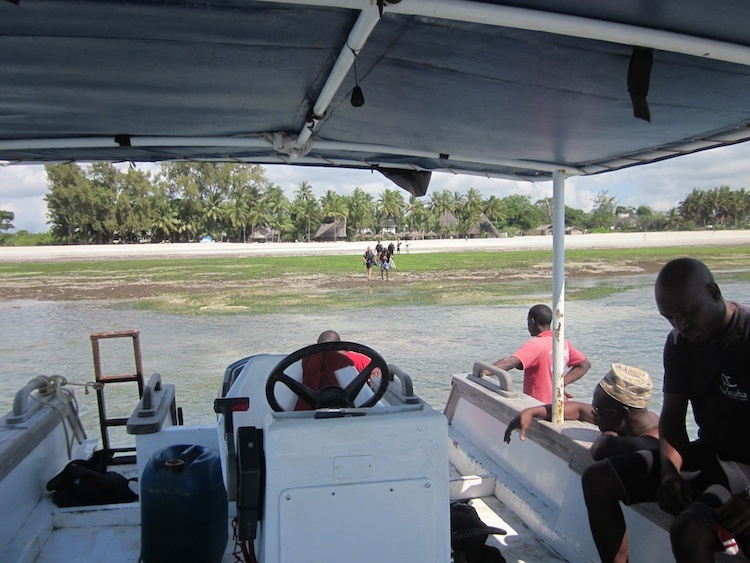 We took a boat out to our dive site and sailed/drove(?) for about 15 minutes - far but not too far, as I could still see land. There were 6 of us: me, Emmanuel - my dive instructor, 3 German divers and their dive leader. They went first and I watched them do it. Unfortunately I could not get any pictures of myself since I was last to go in. Hopefully, there will be other dives in the future. I’m sure you’ve seen divers on TV enter the water by sitting at the edge of the boat and tumbling backwards into the sea. Well, that's what we did. I didn't think I could do it, but I had to. I fell in and was a bit disorientated at first, but I saw the sunlight and kind of floated upwards towards it. To descend, we had to lock our knees into our chest and release air from one of our many hoses (these are connected to our tank). Once down, I had to remember to breathe through my mouth with the regulator (inserted in your mouth and connected to another hose). I felt a bit panicky, but remembered that I had done it in the pool the day before. Also, being the only woman, I did not want to have any "Well, maybe it's because you're a girl...." comments later. It is so beautiful under water. It is totally another world. I cannot even describe it. I saw shoals of fishes swimming together, lots of plants, starfish, sea urchins and even a stingy ray, which zipped away so fast when it saw us. I saw coral and the other divers, at a point. At one point, I started to float up and started to panic especially since Emmanuel, my dive instructor, was not looking at me at the time. When he saw me going up, he pulled me down and released air from one of my hoses to bring me back down. The pressure in my ears was incredible and I had to pinch my nose and exhale to reduce the pressure. Despite that, the pressure still built-up again. Afterwards, my ears were blocked for an entire day. I was underwater for about 30 minutes and when I got back to the surface, I saw one of the German divers there. Apparently he had not been able to get used to breathing through his mouth with the regulator and called off his dive. He had also learnt the day before like me. I could tell that he felt bad and his dive leader did not make matters easier, with his teasing remarks. I love to read-up on things online and so the night before the dive, I started reading an article on scuba diving on Wikipedia. I wasn’t able to finish it and it's a very good thing too otherwise I might never have gone. I learnt that at 20m, some divers suffer from 'nitrogen narcosis', which is like a temporary mania. At 40m, almost all divers suffer from this. The deeper you are going, the mix of gases in your tank has to be different from if you are diving in shallower waters, otherwise, you can suffer from something else that can cause epilepsy, which causes the regulator to come out of the diver's mouth, which of course will lead to drowning. If you ascend too quickly, you can suffer from decompression sickness (also known as 'the bends'), from your body not adjusting gradually enough the changing pressure of the water. Basically there is more pressure underwater than on land and the deeper you go, the more pressure there is. You also need to be super-fit apparently to do it. The medical form I had to fill out beforehand must have had all conditions under the sun listed on it -the first being that you cannot be pregnant. Now that I have tried scuba diving, I LOVE it. It has dangers and so you need to pay attention to the instructions of your dive leader. Of course, this was an easy dive in comparison to other waters and conditions possible (I’ll never forget the film Open Water). This was an incredibly long post, now that I'm reading it. Well, I hope it makes up for all the time away. Dr. Tony Marinho is a practicing obstetrician and gynaecologist in Ibadan, Nigeria. He is an author of several books of short stories, poetry and childrens’ books and he has also abridged Wole Soyinka’s childhood memoirs Ake for children. He is a frequent social commentator maintaining a regular weekly column in The Nation.